Although the Chinese auto market has entered a relatively stable growth period this year after explosive growth in the past few years, the auto supplies industry will continue to maintain rapid growth and become a new growth point for dealers to pursue profits. Recently, the latest release of the â€œWhite Paper on the Trends of Auto Accessories Industry in 2013â€ â€‹â€‹showed that in 2012, the sales volume of China's automotive products market was 566 billion yuan, an increase of 31% year-on-year. The industry predicts that by 2015, China's auto supplies market will reach 950 billion yuan. Experts in the industry believe that the Chinese auto market will maintain an annual growth rate of more than 20 million vehicles in the future, which also indicates that the profit competition in the Chinese auto supplies market has already begun. A large number of powerful ethnic enterprises are competing to rise up and compete with foreign auto product brands to accelerate the competition in the Chinese automotive supplies market. At the same time, with the rapid increase in domestic vehicle ownership, not only will the automobile aftermarket market embrace structural changes, but the profit growth point of the entire automotive industry chain will also shift. The reporter discovered at the 2013 China International Auto Accessories Exhibition that had just ended last week that since the beginning of this year, the automotive supplies market has entered a period of rapid development. During the four-day exhibition, the on-site turnover including professional buyers, domestic and foreign purchasing groups, and large distributors reached 26.207 billion yuan, creating a record high turnover over the years. According to a person in charge of an exhibitor automotive supplies company, its business turnover exceeded 10 million yuan last year, an increase of more than 30% year-on-year, and the transaction volume at the show was also nearly 1 million yuan. Car analyst Jia Xinguang said that Chinaâ€™s auto aftermarketâ€™s profit contribution to the Chinese auto industry is only about 19%, which is a big gap compared to the profit contribution rate of about 69% of the US auto aftermarket. At present, the scale of car ownership in China is over 100 million, and the prospects for the automotive supplies market are bright. The gap with developed countries will be further narrowed, and the market application space will be more open. According to the forecast of China's auto industry trends report, China's auto supplies market will continue to maintain a growth rate of around 30% this year, and sales of auto products throughout the country are expected to reach 660 billion yuan. In the face of tempting prospects, as early as many years ago, there have been a number of dedicated service brands in the automotive aftermarket, including foreign brands Honeywell, Australia, Texas, Barker, Nielsen and others. One person in the industry believes that from the point of view of the development trend of automobile powers, in the process of popularizing the automobile industry, automobile manufacturing and sales often occupy an important profit position in the automobile industry chain. However, after the popularity of automobiles, the sales of new cars slowed down, and the auto aftermarket became an area where the vendors vigorously expanded. However, it is worth worrying that there is not yet a big enough enterprise in the Chinese auto industry. It is still in the stage of â€œwho advertises, who is a famous brandâ€. The reporter saw at the China International Auto Accessories Exhibition that there were 6,530 exhibitors in this exhibition, but only 100 well-known brands were brand names, and most of them were European and American brands. â€œThe market behind the auto market may seem large, but because of the large number of brands and the large number of models, many auto-related goods or accessories are dedicated to the car. It is difficult for the merchantâ€™s products or services to achieve economies of scale.â€ The person in charge of the company reluctantly stated that in the future, with the expansion of the size of China's auto supplies market, there will be a very large-scale production enterprise in the country, and the competition will also be fiercer. It is not ruled out that the industry may be shuffled. The quality of car interior and Exterior Trim Parts is an important criterion that affects consumers' desire to buy. The quality of interior and exterior trim auto parts directly reflects the quality of the car, is an important factor to attract consumers to buy cars. 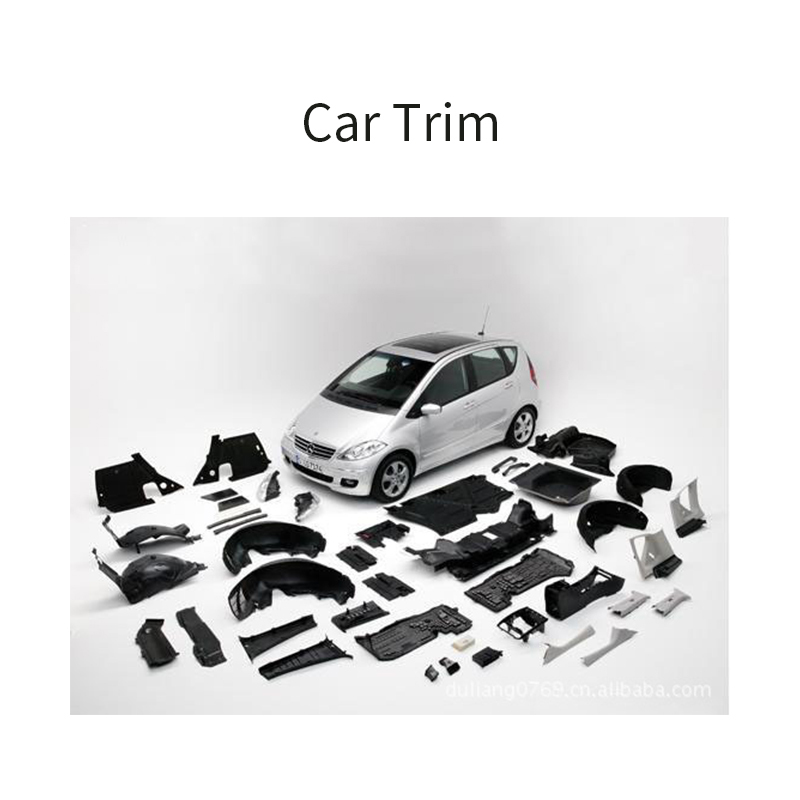 Car trim parts refers to add some items to raise affiliated automotive surface and an inner chamber of aesthetics. It can be divided into interior trim parts and exterior trim parts. Exterior trim parts can make the car more beautiful and fashionable and meet people's demanding meets about aesthetic and individual needs. Including: Front and rear bumpers, body skirts, outside perimeter, spoiler, anti-friction bar, rear door handle, front and rear windshield, car Solar Films decoration, install body kit, plate and the spoiler decoration, skylight, decorative lights ,etc auto parts. Interior trim parts changes inner appearance and create a warm, comfortable interior environment. Including: Dashboard, sub dashboard, door panel, door handle, each column interior panel, blanket, top lining, leather steering wheel, liner decorative side panels, interior decoration accessories, Sun Visor mirror and so on spare parts.